The obvious difficulty and high failure rate of information technology (IT) innovations in government and elsewhere have been central concerns in much of CTG’s work over the past 15 years. Our first-hand experiences, coupled with reviews of the current research, highlight the importance of organizational capability as a critical success factor in IT innovation. It is clear that successful IT innovations, and the transformation they seek to support, depend at least as much on how well the organizations and individuals perform as on the chips, networks, and software. This finding led us, in turn, to further explore the concept of organizational capability and to work with government agencies to develop tools to enhance capability for IT innovation. CTG recognized the need for a more useful way to think about organizational capability for IT innovations. The key problem in most existing approaches is that they are too static and based on oversimplified models. As a result, they do not reflect the high complexity and intricate dynamics of capability as it played out in the projects that were part of our research. Some of the most prevalent approaches, for example, treat capability as a kind of maturity. That is, an organization’s ability to achieve some goal, such as a new software application, is a matter of its place on a maturity scale; each successive level represents higher capability, building on the preceding one. Assessing this maturity is commonly based on ratings of many specific performance and resource factors. This kind of maturity model identifies many of the important factors in software development capability, for example, but largely ignores the interactive aspect of complexity. What’s more, the maturity model suggests a kind of generalized capability across known tasks and processes, whereas innovation projects present organizations with new and often unanticipated task requirements. Other prevalent ways of describing capability are based on existing work routines or combinations of resources available in the organization, yet none seemed adequate. Part of the problem is the variety in both the every-day usage of “capability” and in formal theories. Much of the language is familiar to today’s managers: performance, accomplishment, having the legal right to perform, competent, and having or showing general efficiency. One dictionary definition includes competency in action and in a legal sense, as in competent to enter into a contract. This variety in concepts, combined with lack of attention to the importance of interactions, leads to overly simplistic and inconsistent ways of assessing and building capability. Failure to address the multiple dimensions of capability can then create challenges for those who seek to be innovative and for those who rely on innovation as core to their government improvement agendas. Our work has been aimed at helping government leaders develop a broader understanding of capability as multi-dimensional. This broader understanding can extend discussions about innovation beyond the technical aspects to address policy and organizational capability and the ways they influence each other. Technical advances make many innovations possible, but technology is not enough. Research and experience tells us that innovation planning and management regularly fails to critically assess the capability to perform the actions necessary for success. As a consequence, new projects and innovative programs are unable to deliver on the promises of government transformation. Roughly, by a complex system I mean one made up of a large number of parts that interact in a nonsimple way. In such systems the whole is more than the sum of its parts, not in an ultimate, meta-physical sense but in the important pragmatic sense that, given the properties of the parts and the laws of their inter-action, it is not a trivial matter to infer the properties of the whole. The Sciences of the Artificial, 2nd Ed. Multidimensional—it is made up of several dimensions, all of which contribute to overall capability. Complementary—high or low overall levels of capability can result from different combinations of factors, high levels in some dimensions can often compensate for lower levels in others. Dynamic—it can increase or diminish due to changes within an initiative or in its external environment. Specific to its setting—some elements of capability apply to all settings, but capability for any particular project must be assessed relative to its own specific objectives and environment. 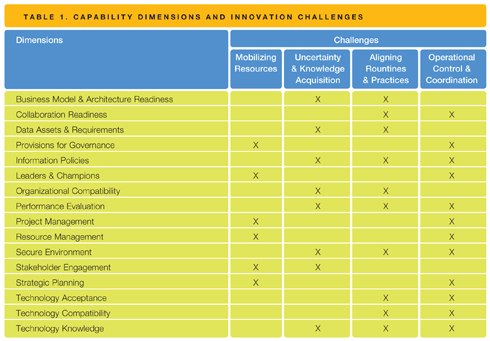 Several projects at CTG have focused on linking this view of capability to specific context characteristics. These projects have focused on intergovernmental information sharing, digital preservation partnerships, and electronic records access programs. Experience in each of these projects showed how specific capabilities necessary in that context contributed to success. We used that experience to then create toolkits designed to assess and help enhance capability. capability to develop new systems and procedures. The first, collaboration capability, includes dimensions that reflect the ability to work together and make plans and decisions in new ways. This type of capability is often lacking. Dimensions in the second group reflect the ability to build systems and inter-organizational processes. This is historically where most attention is directed. However, in more recent research, as illustrated in the case of Oregon’s response to the West Nile Virus outbreak, practitioners increasingly recognize the need to build capability in both areas. In 2004, Oregon was one of the last states in the United States to experience human cases of the West Nile Virus outbreak that began in the late 1990s. Interoperability was a central part of the response coordination effort and required new levels of cooperation between state and with federal agencies. One county-level communicable disease expert involved in response efforts found that for agencies to achieve interoperability on a more systemic and institutional level, they must understand each other’s missions and needs. To achieve this level of understanding, she said, agencies go through several stages of collaboration. The first stage is shake hands: meet and get to know the people from agencies you will be working with. The second stage is to coordinate planning and training with agencies through exercises and routine responses. Only after going through these first two stages can agencies reach the stage of true interoperability. Building this collaboration capability takes time and resources, and only through legislative and executive support can individual agencies begin to work through the first two stages and be prepared for interoperability when and where it’s needed. Results from this and related projects reveal a more robust understanding of the characteristics and components of capability in the context of government IT innovation. This new understanding provides a foundation for a transition from a technology-based view of government transformation to a capability-based view. Using this new understanding, we set out to model capability for IT innovations of various kinds in a different way. Our approach was to focus on a particular type of IT innovation that was both an important goal for government agencies and one that might yield new insights. We began with information sharing and integration in the criminal justice domain. With support from the U.S. Department of Justice, we recruited a group of over 20 criminal justice professionals and researchers from across the U.S. who were engaged in information sharing initiatives. They worked with CTG to help build a new capability model and assessment method from the ground up. This group worked with CTG research staff over a two-year period to develop and test a new capability framework and assessment tool. That tool was well received by the criminal justice community and is now being used in information sharing initiatives in government agencies. The tool, and the framework it is built upon, treat capability for creating new information sharing systems as both multi-dimensional and multi-organizational; complex systems with interacting parts. The way we describe the overall health of a person, for example, might be based on a profile of many measures, such as blood pressure, cholesterol levels, fitness, etc., not a single measure or the health of a single organ. Similarly, information sharing involves multiple agencies or parts of agencies. Therefore, a capability framework must include individual organizational units along with how they interact to create a capable collective. This premise requires a multi-level rating or assessment scheme. In CTG’s approach, the participants in an individual organization create the capability profile by rating their unit on 16 dimensions. The rating on each dimension is the aggregate of their ratings on several sub-dimensions that reflect a more detailed understanding of each dimension (180 sub-dimensions overall). The 16 main dimensions and their sub-dimensions were developed by the project team, based on their knowledge and experience, and modified by field testing. Table 1 shows how this dimensional framework links to previous research on capability and innovation, in particular to four main organizational challenges to successful innovation. Using the same approach of a combined expert panel and literature review, a similar set of dimensions and assessment methods has been developed to support the government archive and library communities in the development of partnership programs for the preservation of state government information in digital form. Mobilizing resources, uncertainty and knowledge acquisition, aligning routines and practices, and operational control and coordination are four well known challenges to innovation. How these challenges play out in particular IT innovations in the governmental arena depends on the capabilities of the team driving that innovation, as well as capability within the broader policy and organizational environment of the initiative. 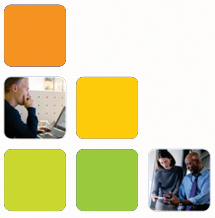 The capability-based view offered here allows for a more specific consideration of the complexity of an IT innovation in context; an examination of the 16 dimensions of capability by each participating agency and then collectively across those same agencies provides for a more nuanced and detailed understanding of what is actually possible. For citizens to benefit from government investments in innovation, government agencies and their partners must be able to think innovatively as well as to act effectively. The most important innovation may be greater attention to the complexity of a particular IT initiative and of the context within which that initiative will be carried out. The capabilitybased view of IT innovation developed here at CTG provides a framework for guiding more systematic assessments of capability and for laying out plans for both building missing capability and leveraging existing capabilities toward successful initiatives.